Is It a Boat—or a Plane? On Tuesday, June 19, the Fort Berthold Technology & Innovation Summit was held at the 4 Bears Casino Event Center. During the summit, Marty Robbins of Fast Ferry Management, Inc., spoke about the suitability of a hovercraft ferry to provide year-round service across Lake Sakakawea as part of the Fort Berthold Public Transit and Ferry Plan. Unlike traditional ferry vessels, hovercraft ferries ride on a cushion of air created between the vessel and the surface of the water—and are capable of operating over ice. This means a hovercraft ferry would be able to operate nearly 365 days a year, whereas a traditional ferry vessel would likely be out of commission for at least three months or more each year, depending on how long the reservoir remains frozen. 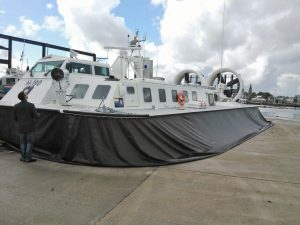 There might be a few scattered days each year when extremely high winds make operating the hovercraft impossible, but for the most part a hovercraft ferry would operate twelve months out of the year. 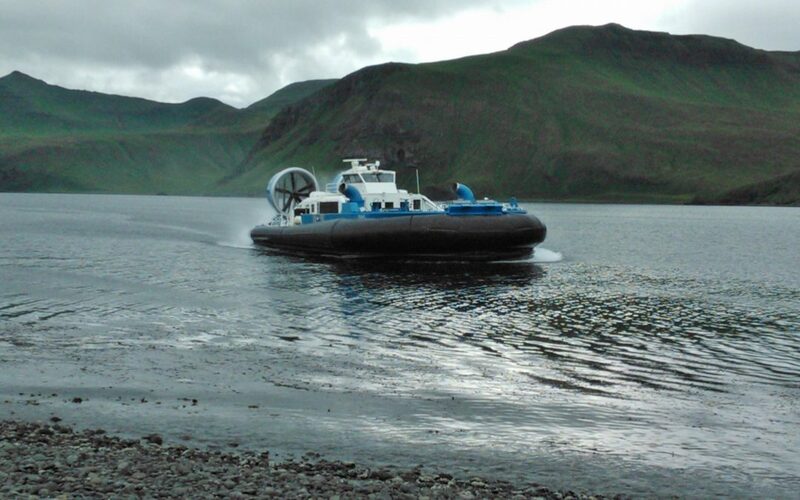 Hovercraft ferries also operate at higher speeds and require less fuel than conventional ferries, but have higher maintenance costs. 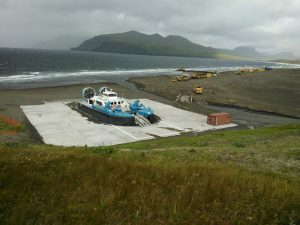 Another key benefit of a hovercraft ferry is that it is capable of landing right on shore and could utilize existing boat ramps, depending on the size of the hovercraft ferry. Such a vessel would be built to meet the needs of Fort Berthold, and could be built to accommodate 4 to 6 vehicles in addition to passengers. A ferry would also utilize MHA Nation’s largest potential free infrastructure system: the very water that has separated its communities since 1956. In addition to the historical and cultural significance of reclaiming traditional use of the Missouri River, a ferry would greatly reduce travel time, provide an alternative to truck-congested roads, and potentially reduce response time for emergency responders. But there are of course costs to implementing a ferry service, as with any public service. That is why strategic planning is so critical to any development on Fort Berthold, and why such planning must include and thoroughly consider community input. A ferry service plan determines the feasibility, costs, risks, and benefits of transporting people and cars at key points across Lake Sakakawea by ferry.It is intended to provide the Tribes with comprehensive and current information necessary for the Tribes to then make a decision on if and how they would like to proceed. To date, several public meetings have been held and responses to transit surveys have been solicited, received, and incorporated into a final report that will be delivered to tribal leadership, including community feedback that has been received. Marty has been involved in all aspects of fast ferry operations for over 25 years. His experience includes conventional passenger-only high speed aluminum catamarans as well as hovercraft. A graduate of the University of Utah with a degree in Fuels Engineering, he is also a Registered Professional Mechanical Engineer in the State of Washington. 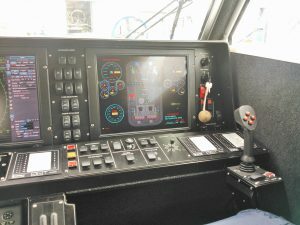 His skills include planning, operations, facilities, logistics, and regulatory liaison in the public and government sectors of waterborne public transportation. Since transparency cannot be taken for granted, it seems like go-nogo is decided by a very few tribal members. Say 3 meetings opinion. with 40 comments at each, 120 tribal members have a for/against the bridge. Say the split is 70-30 in favor of the bridge, yields 84 members. Say your team is 10 people, your report reflects the for/against. The 7 TBC mentions your report a gives a too-short comment period, say 5 comments. Regardless of the study results, it will be passed due to the potential influx of non-tracked money. So 106 members are touched out of 10k+ for this foregone decision. I apologize for my cynicism, its based on what I read. Although the notifications to me are too short to determine the pros & cons. Many legislature decisions are made with a decision-statement, pros and cons. Now you vote. Hi Ray. Thank you for your comment. It is hard to predict how the Leadership will use the study results and recommendations. 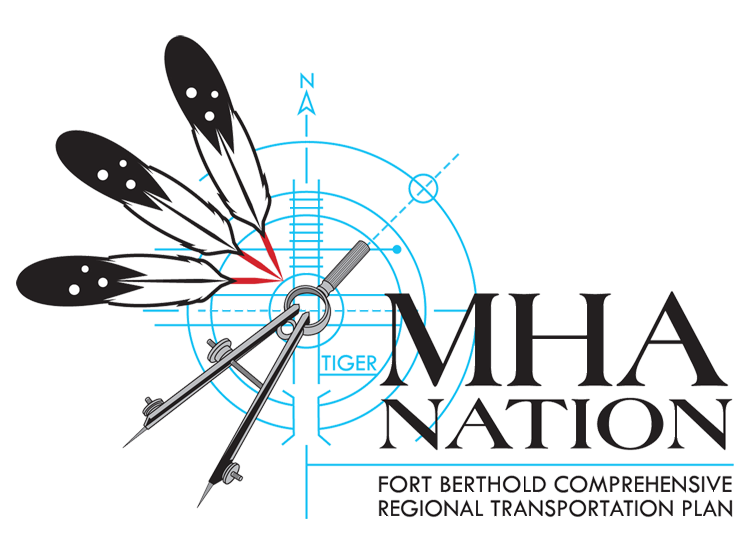 This is probably the first time the Council commissioned a long range strategic study of the infrastructure on Fort Berthold, so there is no track record about how the information will be used. Each of the study areas are complex and require a lot of reading and study to fully understand. However, the long range strategic plan should provide a baseline document that describes the background and current available information on the topic, provide an opportunity for the public to participate and comment, and describe the options going forward. This should be an ongoing process that periodically updates the data and incorporates new realities regarding economics, law and policy. Since this is the first effort there will certainly be a learning curve for everyone involved. However, the principal of making informed decisions based on available information, sound research and public input is a strong move forward. You are right in your observation that public participation by MHA members has been light. We are trying to create a safe space in which people can learn and get informed, then apply their perspectives, needs and ideas. We have an incredible depth of knowledge and experience in our tribe. But we cannot make anybody attend a meeting or read a article and provide their comments so the process will go forward based on what we are able to accomplish in this first time out. There are a lot of people out there with strong opinions, but not many are willing to take the risk at this time to put their comments forward. I have met some amazing Tribal Members that did show up at the meetings and am impressed by their desire to learn and contribute to a planning process. They didn’t know what this was all about, they listened and raised their concerns, and they helped make this a better long range strategic plan. I thank you for your comments. I am not a tribal member or have very much to say about which systems of transportation would be of best choice for the MHA nation members and the public to use or have. I really want to thank Ron Hall and a number of individuals form the tribe I have visited with and listened to over the past few years about connecting the lands of this tribe which have been divide by water. I serve as one of your five county Commissioners from Dunn County which is on the south side of the reservation areas I also was the past chairman of Vision West ND when the idea of a ferry surfaced and was pushed along for a feasibility study. I am a National Association of Counties Organization (NACo) board member for the state of North Dakota and service on the NACo transportation Committee and have seen documents which relate to this study at the national level. I have attended three area meetings to date dealing with the bridge information or ferry information available at this time. Tribal attendance at all three meetings was not in large numbers but the members who attended asked question of great concern for the MHA people and the really reasons “why” this transportation system needs to be developed. When I seen the message “what do you want this tribal community to look like in 20 years”? Predicting is one thing but I can say planning is so necessary to allow for growth, to build a vision and to be able to delivery that vision to the next generation. If we take time to think about what our great -great grand father’s done in these areas as to building roads, bridges, village’s which are now today known as towns and the growth in education and medical services over a period of 150 years. Changes has happened and the challenges have always been present at every level of change! So what is our or your future going to look like? I know many of us want no additional traffic in our back yards or near our homes, but I really believe the growth of connectivity far out weighs the few problems that we think about during this planning process your Communities are going through. Retaining our elders, our youth, bring in new members, building stronger financial opportunities for ourselves, industries and businesses, greater public safety and better EMS service to these areas needs to be part of the plan for the future. Thank you Ron Hall for your leadership working with this project and the many others who have works on this project to-date, in making this information available to the people of MHA and to many others who will read and review this information over the next months.